After the success of their other "Illustrated Classics" editions, Ian Edginton and I.N.J. Culbard have once again teamed up. 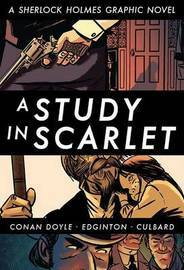 This time, they've created a visually compelling graphic novel adaptation of Sir Arthur Conan Doyle's masterpiece "A Study in Scarlet"--which introduced the world to the immortal detective Sherlock Holmes and his friend and chronicler, Dr. Watson.The superb writing and beautiful art takes Conan Doyle's supernatural tale to new heights.